Are you there? Share your photos and videos, but please stay safe. 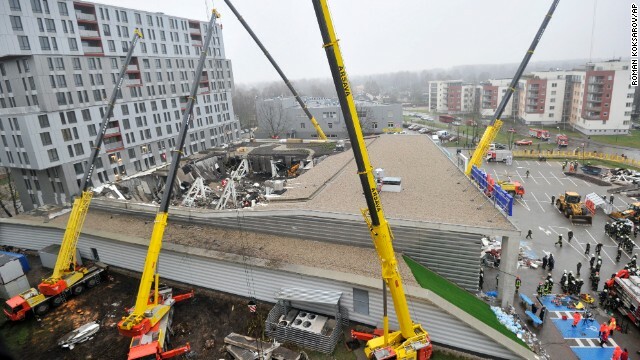 (CNN) -- The death toll from the collapse of a roof at a supermarket in Latvia's capital, Riga, climbed Friday to 51, the mayor said. 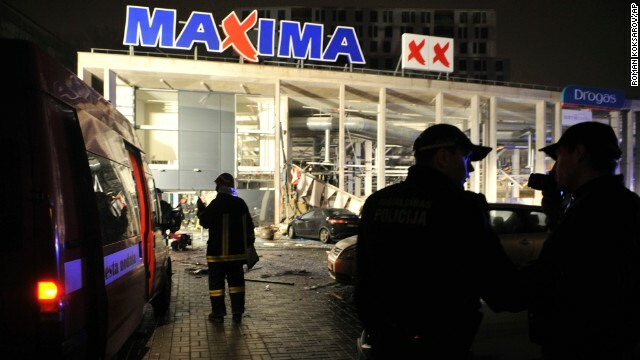 Between five and seven people are still believed trapped in the debris from Thursday's collapse at the Maxima supermarket, in western Riga, Mayor Nils Usakovs told CNN by telephone. Latvia's national news agency LETA said police were using surveillance camera recordings to try to pinpoint the likely locations of victims under the rubble, the State Fire and Rescue Service of Latvia said on Twitter. By Friday afternoon, 47 bodies had been recovered from the collapsed structure, LETA said, quoting a state police spokesman. The supermarket collapse is the Baltic state's deadliest accident since it won independence from the Soviet Union in 1991, the LETA news agency reported. 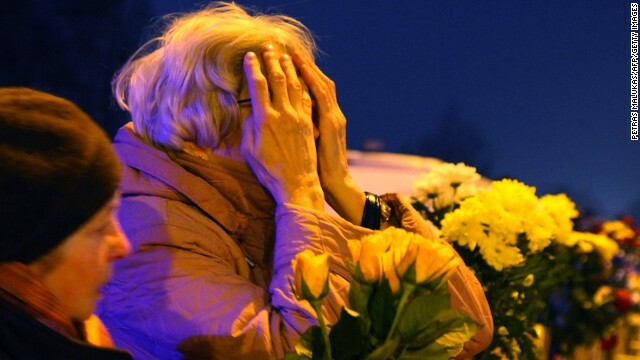 Latvia's previous most deadly accident was a nursing home fire that killed 26 people in 2007. At least 48 people were injured in the collapse, Usakovs said. Three firefighters were among the dead. Latvia's Interior Ministry said their families would receive 50,000 LVL ($95,600) in compensation. 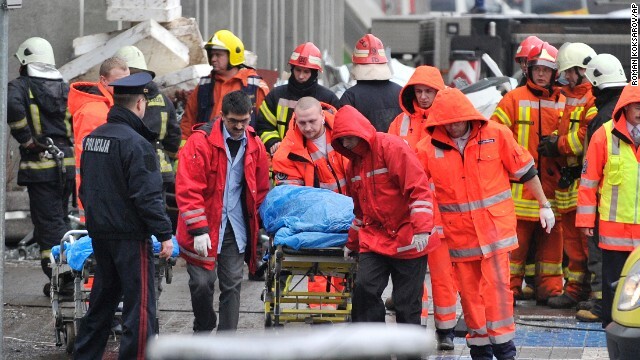 Treatment for rescue workers injured in the operation would also be paid for, it said. 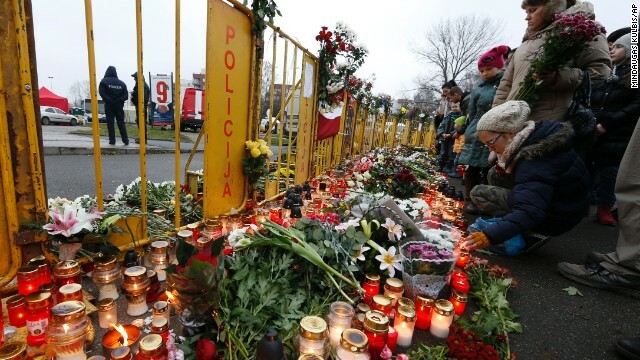 People place flowers and light candles in front of the Maxima supermarket in Riga, Latvia, on Saturday, November 23, two days after dozens of people reportedly died in a roof collapse. 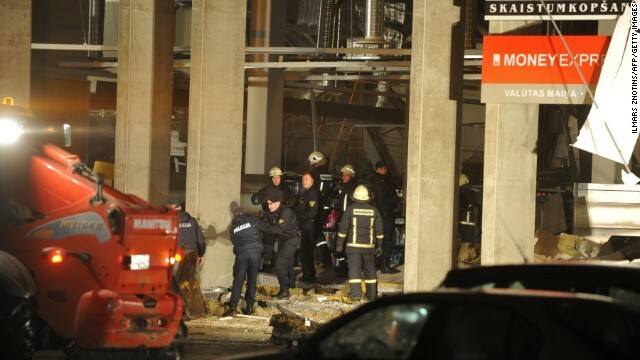 Riga Mayor Nils Usakovs said authorities suspect building materials stored on the roof caused it to collapse Thursday. Debris piles up while people put flowers and light candles in front of the supermarket on November 23. The collapse was the Baltic state's deadliest accident since its independence from the Soviet Union in 1991, local media reported. A woman waits for news near a barricade surrounding the supermarket on November 23. Local media reports firefighters are among the dead from the collapse. Rescue workers search debris on November 23. Search teams continue to comb the rubble for more bodies, Rescue Service spokeswoman Viktorija Sembele said. 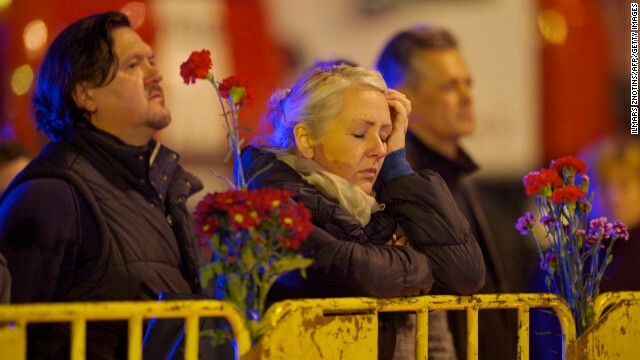 People leave flowers at the scene where the supermarket roof collapsed in Riga on Friday, November 22. Damage is visible in the daylight at a Riga, Latvia, supermarket on November 22. 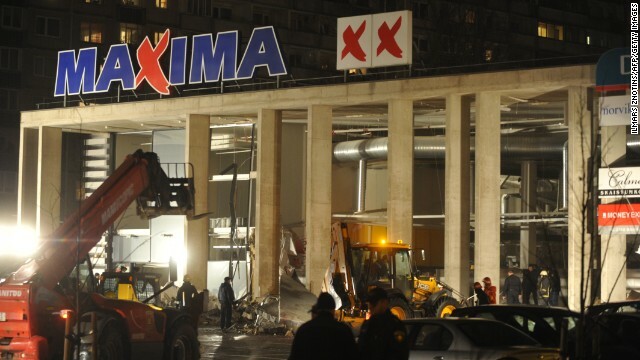 Rescue workers search through the debris of the Maxima supermarket in Riga on November 22. Rescue workers carry a victim on a stretcher outside the market on November 22. 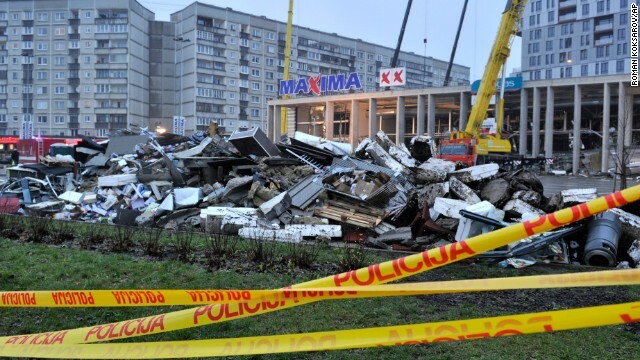 Debris piles up in Riga on November 22 after rescue teams removed it during the search for victims in the roof collapse. 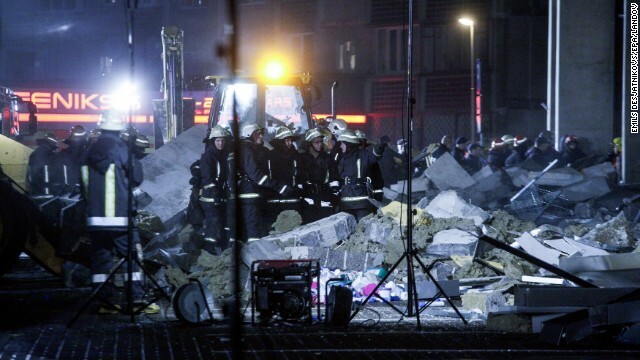 Rescue workers search through the rubble for victims at the supermarket on November 21. 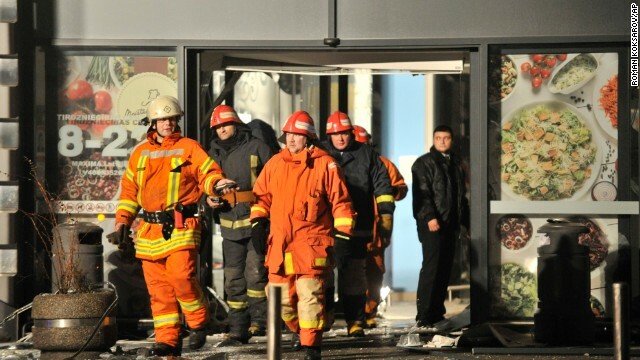 Rescue workers outside the Maxima supermarket after the roof collapse on November 21. 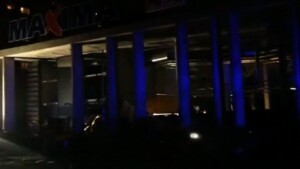 Rescuers work at the Maxima grocery store. 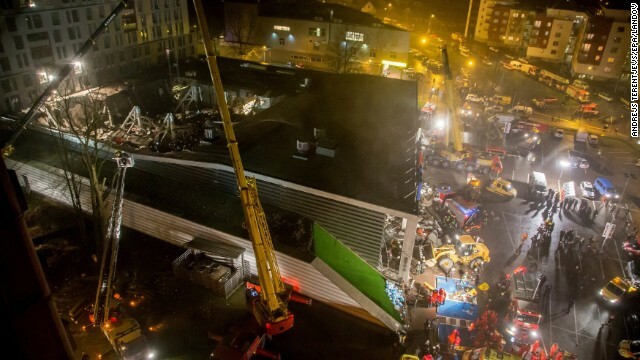 Dozens also were injured when the roof of the large grocery store in the Latvian capital collapsed. 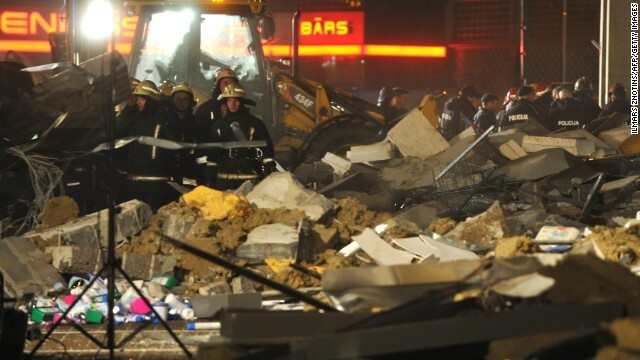 Rescue workers stand amid the debris from the collapse. 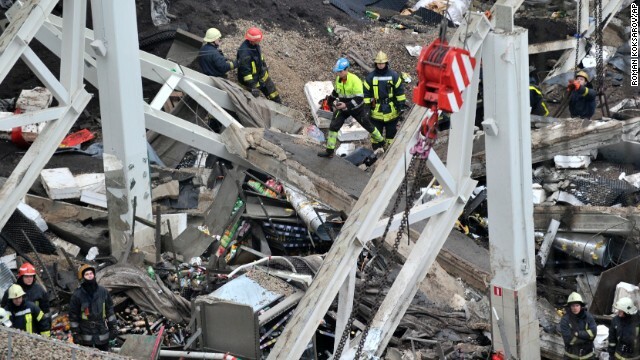 Rescuers hunt for survivors after the collapse. Rescue workers remove debris from the scene. Search teams continue to comb the rubble for more bodies, Rescue Service spokeswoman Viktorija Sembele said. "The firefighters are still working to find people. They are putting away the constructions and still approximately 600 square meters of this collapsed area should be searched through," she said. Sembele declined to speculate on the cause of the collapse. "There are a lot of versions, a lot of stories. The real cause of this tragic accident will be investigated by state police and other authorities once the rescue is finished," she said. 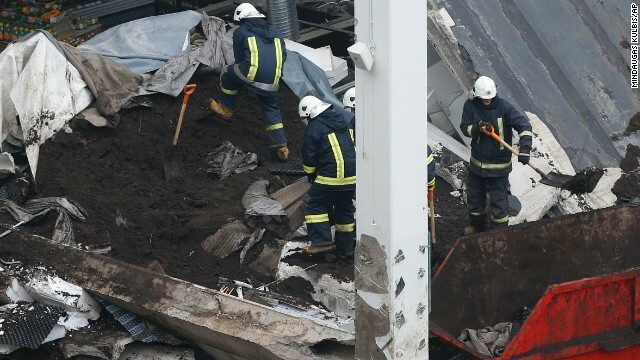 Usakovs told CNN that authorities think building materials stored on the roof caused it to collapse. 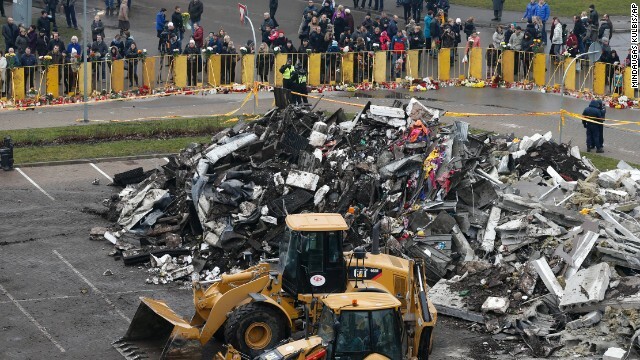 Latvia's Ministry of Foreign Affairs said some of the victims of the collapse had not yet been identified. "Police (are) currently working at the scene to identify the dead; for victim identification, police officers are also cooperating with relatives who gather on the site," a ministry statement said. It asked relatives of anyone missing to call emergency services. It said a condolence book has been opened in its embassy in Russia, which has received flowers and messages of sympathy. European Commission President Jose Barroso issued a message of condolence after the collapse. "I am deeply saddened by the terrible tragedy," he said. "Please convey my expression of deepest sympathy and solidarity to the families of the victims and those who lost their lives in rescuing people as well as to all those affected by this tragic accident." CNN's Marilia Brocchetto, Neda Farshbaf and Talia Kayali contributed to this report.